Overview :: Go-kart powered by a lawnmower engine! Below are the first two Drawings out of a total of 21 which form the complete set of plans for making this lawnmower powered go-kart. This is the first drawing in the complete set of plans for this go-kart. It introduces the kart and the parts and tools required to make this kart. The size of the kart will accomodate the majority of youngsters and teenagers, and although a seat is not included in these plans, it could always be added later, with a seatbelt too for extra safety! Depending on the height of the driver (length of their legs), the karts length could easily be shortened (from 1.6 meters), allowing their feet to reach the front steering axle. 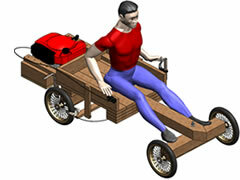 The original simple wooden go-kart with no engine. If this is the first kart you are making, try this first. Link to plans. It can easily be adapted afterwards to include a lawnmower engine. The lawnmower engine is positioned at the rear of the kart, for simplicity. This kart was originally adapted from the basic wooden go-kart which had no engine. This kart is not an "ideal" design in any way. It is a rough and ready mechanically propelled go-kart which most people will be able to make. 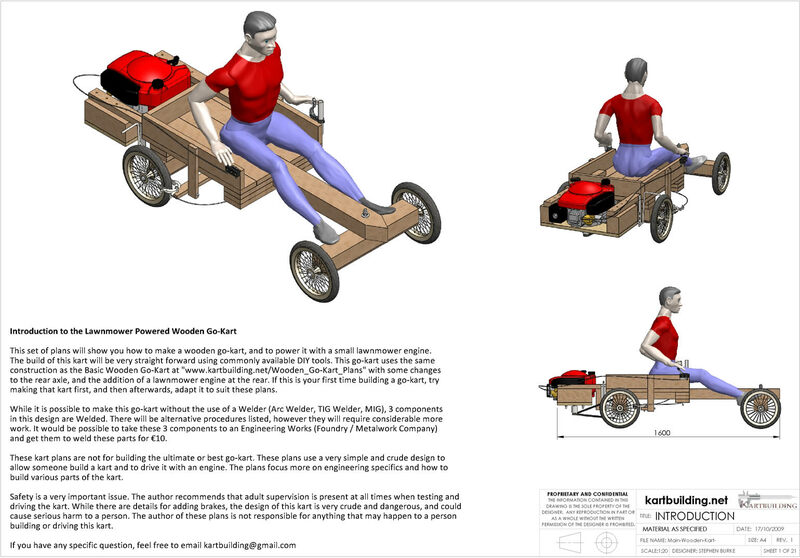 Building this kart will teach you many concepts and methods used in kartbuilding, transmission and small engines. The author built this kart, drove it for a few months, and then went on to make a completely new one from metal. 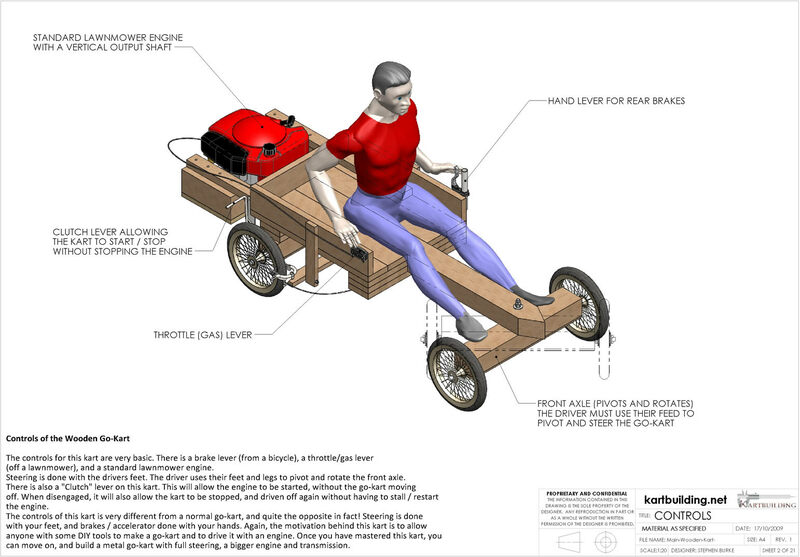 Building this kart gives confidence and inspiration to go further into making and designing go-karts. If you feel that making this kart with the lawnmower engine is a little much or dangerous, you should start with the basic wooden kart (which has no engine). The driver has several different controls to operate when driving this kart. 4. Clutch lever with their right hand (when starting and stopping). It will be apparent that it will take a little skill to operate this kart, and that not everyone might be able to operate it. The controls in this kart might seem a little strange compared to a typical go-kart with feet pedals. This is because these plans are for a "simple wooden kart". The plans, details and concepts can be taken and applied to any type of go-kart should you wish.